The Dimplex Deluxe electric fireplace LED log set and trim kit is designed specifically for those who want to retrofit their existing fireplace with an energy efficient, extremely attractive option. This trim kit is expandable for openings 24.5″ W x 19.5″ H to 43″ W x 28.5″ H. The log insert itself is 23 inches wide. The realistic LED flames are designed to offer the beautiful look you would expect from a crackling fireplace and hand-finished logs featuring inner glow only add to the effect. 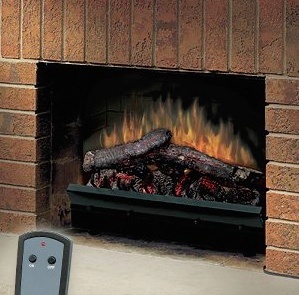 You can turn the fireplace on and off from the comfort of your favorite sofa or chair with the on/off remote control. – great use as a supplemental heat source. With this proven electric fireplace insert, you won’t need to worry about building a fire and keeping it burning through the evening. 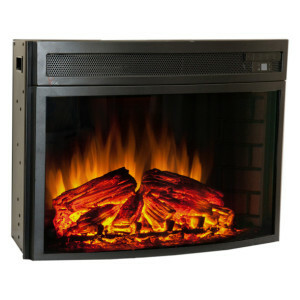 Instead, you can just sit back, relax and enjoy the warm ambiance your new fireplace will offer. This Comfort Smart product includes a 1 Year limited warranty. Why no safety information? I think that is an important feature. That’s a really good point, Anne. I’ll look into it!